After the washout at the Eden Gardens, India and Sri Lanka go into the second cricket one-dayer here tomorrow with the home team still grappling with injury worries ahead of the crucial game which gives Virender Sehwag one last chance to push for a World Cup berth. Hosts Assam caused a major upset at the 33rd National Games when they defeated formidable Punjab 5-3 in the men’s hockey competition here today. Jammu and Kashmir were deprived of vital match practice as well as exposure on account of inclement weather against Delhi here today. Rain played spoilsport as the North Zone Ranji Trophy one-day match between the two sides was washed away at the Sector 16 Stadium. Showing no signs of repentance, Indian captain Rahul Dravid today said that he was not worried by the Cricket Board’s stand to seek an explanation from him for his outburst against the team manager for the South African tour. Mohammad Yousuf scored a stylish 79 and Pakistan’s tail gave their team a late boost before rain washed out the third one-day international against South Africa at St George’s Park. Taped conversation between alleged bookie Mukesh Kochar and West Indies cricketer Marlon Samuels, does not prove that the Nagpur One Day International (ODI) was fixed, Maharashtra Deputy Chief Minister R R Patil said. Pakistan’s World Cup hopes suffered a jolt after their cavalier all-rounder Shahid Afridi was today banned for four one-dayers for bringing the game into disrepute. The Bangalore Open women’s tennis event lost its sheen today with star attraction Serena Williams pulling out in the last minute due to sickness. The late withdrawal of the eight-time Grand Slam champion came when the American failed to board the flight back home last night after developing a “bad flu”. Leander Paes and Sunil Kumar Sipaeya pulled one back for India, beating their Uzbek rivals in doubles to keep India’s hope alive in the Asia-Oceania Davis Cup Group 1 rubber here today. Poulomi Ghatak outclassed Singapore’s sixth seeded Yue Su 4-0 in the quarterfinals to remain the lone Indian challenger in the last four after Singapore paddlers made short work of Mouma Das and Nandita Saha in the women’s singles at the Indian Open ITTF tournament here today. The countdown has begun and the city hockey buffs are set to witness foreign players from Australia, Spain, Argentina and Pakistan in action in the second leg of third edition of the Premier Hockey League (PHL) beginning at the Sector 42 Stadium, here, tomorrow. Achanta Sharath Kamal survived some anxious moments before shocking second seed Yang Zi of Singapore to storm into the semifinal of the Indian Open table tennis Championship here today. S.S.P. Chowrasia and Amandeep Johl carded an identical one-under 71 to jump 10 places to tied 22 after Jeev Milkha Singh double-bogeyed his way to nosedive 30 places down the leaderboard the end of the third round of Maybank Malaysian Open here. The three injured players, Yuvraj Singh, Irfan Pathan and Ajit Agarkar, who had to sit out of the first match had still not recovered fully and were doubtful starters for the day match at the Madhavrao Scindia Stadium. In view of the injuries, the Indian team management would wait till tomorrow to decide on the playing eleven for the match, which is of vital importance to Sehwag and paceman Munaf Patel who need to prove their form and fitness ahead of the World Cup team selection on Monday. Yuvraj has been down with a back niggle while Pathan had still not recovered from a sore shoulder. Agarkar, who was down with flu, was still weak though he did take part in the practice session. “Among the three, Agarkar has a better chance of playing. He bowled a few overs at the nets, but looked a little flat”, captain Rahul Dravid said. It will be a test of character for the out-of-form Sehwag, who was recalled into the team after being dropped for the series against the West Indies, as he gets just one opportunity to impress the selectors who meet in Mumbai on Monday to finalise India’s 15-member World Cup squad. In case Sehwag failed, it would leave the selectors in a dilemma. They would have to make up their minds on whether to take the dashing opener to the World Cup despite his poor form. The selectors would also keep a close watch on players ridden with injuries as fitness issues has been a major cause of worry for the team of late. For India, the major plus point in the rained out tie at Kolkata was the bowling of lanky right arm pacer Munaf Patel who was close to his best form after having struggled with an ankle injury for the major part of the South African tour. Patel bowled at a good pace to and picked up two wickets to impress the team management. The bowler finished with impressive figures of 2 for 25 from seven overs while the other two pacers Zaheer Khan and Shantakumaran Sreeshanth were mauled by Sri Lankan opener Sanath Jayasuriya. Sreesanth continued his wayward ways by conceding 36 from 4.2 overs after his disappointing show in the previous series against the West Indies, which could be a point of concern for the selectors. If Agarkar is available, he is expected to replace Sreesanth in the bowling attack for tomorrow’s tie and then it would pose some interesting questions about the Kerala speedster’s selection for the World Cup. The indications are, however, that the selectors would retain the 15 they had chosen for the first two matches. Interestingly, the only bowler to have taken four wickets at this normally high-scoring venue, left arm pacer Rudra Pratap Singh, is out of the selectors’ radar for now. The new-look Indian opening combination of Sourav Ganguly and Robin Uthappa is set to continue while the Indian middle order looks very formidable with the return to form of Sachin Tendulkar and the solidity of skipper Dravid to weather any kind of storm. Harbhajan Singh was the lone frontline spinner picked in the Kolkata playing eleven and he’s expected to perform the same role here too on what was expected to be a perfect batting pitch prepared by curator Rasik Makwana. “The team batting first would score over 300,” said the groundsman indicating perhaps that the team which wins the toss is almost certain to bat first as the dew factor is not an issue here with the wicket being covered overnight. The encounter would also be one last chance for out of form Sri Lankan players to select themselves for the World Cup. Captain Mahela Jayawardene, opener Upul Tharanga and their in-form batsmen Kumar Sangakkara would be keen to make amends for their cheap dismissals in Kolkata. Out of the nine previous ties played at this ground, India have been involved in eight and won half of those clashes, including the last three. In a thrilling Group B encounter at the Maulana Md Tayabullah hockey stadium at Bhetapara, the home team came from behind twice to register the landmark result. The hosts scored through C.S. Singh (32nd minute), T H Brojen (55th), S Dad (57th and 63rd) and Sanjib (65th). Punjab found the target through Gagandeep Singh (10th and 61st) and Satwinder Singh (54th). In other matches of the day, Chandigarh held Orissa 1-1, Delhi beat Tamil Nadu 2-0 and Services pipped Maharashtra 2-1. In the match involving the hosts, Punjab drew first blood when Gagandeep latched onto a long ball and beat two defenders before slotting one past Assam custodian Jagdish. Assam drew parity just before the half-time when C.S. Singh tapped home from a goalmouth melee following a penalty corner attempt. The match came to life in the final 20 minutes when as many as six goals were scored. The turning point was the yellow card to Punjab’s Kuljit Singh, which left his team a man short. However, the north Indian team scored their second goal when Satwinder deflected a free-hit taken from outside the striking circle. Assam restored parity through a penalty corner rebound by Brojen. They took the lead soon after as Dad scored. It was 3-3 when Gagandeep converted a penalty corner, but Assam scored twice in two minutes to settle the issue. Punjab bagged the first gold of the 33rd National Games when their men won the 1500m men’s team time trial event in cycling here today. Andhra Pradesh cyclists finished with the silver while local fans had something to cheer for as hosts Assam got the bronze as the first three medal of the 10-day multisports extravaganza were decided at the Rupnath Brahma velodrome. Later, in womens 1500m team time trial, Manipur girls pedalled to glory to win the gold, leaving behind competitors from Punjab and Assam, who had to be content with the silver and bronze respectively. The Punjab men, represented by Abhishek Rana, Sukhwinder Singh, Gurmeet Singh and Sarabjit Singh, completed the distance in 1:46.77 seconds. Rameshwari Devi, Chaoba Devi, Tambisana Devi and Anita Devi made up the Manour womens lineup, which took 2:08.10 seconds to reach the finishing point. The National Games is turning out to be an event dominated by organisational dysfunction as the athletes, support staff and mediapersons continued to go through harrowing times for the second consecutive day. The mediapersons covering the 33rd National Games here are badly hit by ‘poor dissemination’ of results and information. The media centre at the Nehru Stadium, venue of at least five sporting disciplines, wore a deserted look with no authorised person available for switching on the computers. The situation at the media centre at the main sports complex at Sarusajai was no different. Results of the events were not available on time and no official was present to brief the journalists about the proceedings. Mr M.K. Yadav, CMD of the state government electronic company AMTRON, responsible for media communication, told PTI that the collapse of a communication tower seriously disrupted Internet and mobile services since the morning. “Efforts are on for switching over to alternate communication towers for restoring at least the internet services so that the Games results could be disseminated to the media,” he said. On the other hand, over 30 school children participating in the opening ceremony yesterday had to suffer a lot due to the lack of drinking water and poor quality food provided to them. Inexperience of the organisers was evident as far as management of the medical team is concerned. Members of a team from the Gauhati Medical College said they had been provided with only 100 pain relief sprays for the 10-day sporting event, whereas 20 bottles were required for a football or hockey match. Overcast conditions right from the morning resulted in drizzle, forcing the players indoors when the contest was in the 28th over. With the showers not abating, the first round match in the eight-day league phase matches being played at Mohali and Ludhiana also were abandoned in the afternoon. Batting first, Delhi were 90 for three in 27.3 overs when the rain interruption stopped the play. In whatever little play was possible, strapping fast bowler Abid Nabi and off-spinner Dhruv Mahajan bowled well to claim three key wickets. The batsmen back in the pavilion were former India opener Akash Chopra, Gautam Gambhir, in line for a spot in the Indian World Cup squad, and Shikhar Dhawan, former India under-19 player and a young bright India prospect. Though he bowled just seven overs, young Abid Nabi showed glimpse of his talent. Nabi bowled with enough fire and control. Getting his deliveries to bounce appreciably, the fast bowler had the batsmen, having far more experience and exposure, groping for the ball. The in swinging deliveries he bowled at a fair pace, which had the batsmen in trouble, was his stoke delivery. He claimed the scalp of Akash Chopra and finished his first spell with figures of 6-1-15-1. Off-spinner Dhruv Mahajan also bowled impressively. After the fast bowlers gave way to spinners, Dhruv took charge. First he deceived Gambhir, who ended up giving a return catch to the bowler to be back in pavilion. Gambhir made 27. The left-handed batsman was not at his effervescent best and faced 64 balls and hit a lone boundary. Dhawan looked in better nick and control and looked good for a big innings. But he was undone by a Mahajan delivery when the batsman was batting on 38. Mahajan had an impressive outing, claiming two wickets in his eight overs. Mithun Minhas and Mayank Tehlan were at the crease when weather forced the play to stop. With conditions showing no signs on improvement, the match was abandoned when final inspection was done at 2 pm. The teams got two points each. Delhi will now clash with Punjab in their second match at the PCA Stadium in Mohali, while Jammu and Kashmir now travel to Ludhiana for the match against Services. Both the matches will be played on February 12. Akash Ghai adds from Mohali: Continuous rain in the region played spoilsport the opening North Zone Ranji Trophy one-day match between Punjab and Haryana teams at Punjab Cricket Association Stadium here today. The match, which was restricted to 10.2 overs due to inclement weather, was called off later. Both the teams were given two points each. Earlier, Haryana team, which started on a cautious note, was put in to bat by Punjab after winning the toss. Openers Sumit Sharma (8 no) and Chetan Sharma (18 no) could score just 35 runs in 10.2 overs when the rain interrupted the match. For Punjab Gagandeep Singh and VRV Singh bowled five overs each conceding 17 and 14 runs, respectively. The home team members seemed disappointed as the team had an edge over the visitors. “No doubt, we had an edge over Haryana. We have good preparation so abandoning the match really saddened us,” said Reetinder Sodhi, ace batsman of the Punjab team. LUDHIANA: The match between Himachal Pradesh and Services at the Punjab Agricultural University campus ground here was abandoned due to rain today. The match began over one hour behind the schedule since the outfield was not conducive for play due to overnight rain. Umpires decided to curtail it to 45overs each side. It again started raining with Services struggling at 38 for four after 14.2. This forced the umpires to call it a day. The two teams earned two points each. Dravid said controversies had become a part and parcel of Indian cricket and he had learnt to deal with such situations. “If they ask for an explanation (on his outburst against tour manger Chetan Desai of Goa). I will give it to them. It does not worry me, nothing worries me,” he told reporters. “There have been a lot of controversies in the last few years. It has become part and parcel of Indian cricket. We have learnt how to handle all this. We have to focus on the game”, Dravid said. The BCCI secretary Niranjan Shah had said yesterday that the Board would seek an explanation from Dravid for the outburst but appeared to downplay the whole incident today. Pakistan made 245 for eight in a rain-interrupted innings, which finished with one ball remaining. South Africa were unable to start their reply because of rain. The teams will go to the fourth match in Cape Town on Sunday with the five-match series tied at one match each. The tourists were 217 for eight when rain stopped play after 47 overs. Azhar Mahmood and Rana Naved-ul-Hasan added another 28 when play resumed. The innings ended bizarrely. With rain falling, the umpires kept the players on the field with Charl Langeveldt bowling what should have been the last delivery of the innings. It slipped from his hand, Naved swung at it and it sliced over the slips for six as no-ball was signalled because the ball was too high. With the rain having become heavy and ground staff running on with covers, the umpires took the players off. Samuels was caught discussing over phone team details with Kochar ahead of the January 21 one-dayer in Nagpur. “The conclusion drawn by police from the conversation does not establish that the Nagpur ODI was fixed”, Patil, who also holds the home portfolio, told reporters. Afridi was charged with a Level 3 offence after an incident, which took place following the batsman’s dismissal during the first ODI against South Africa at Centurion on February 4. As the player walked up a set of stairs towards the dressing room, a spectator apparently said something to him and Afridi reacted by appearing to push his bat at the person in an aggressive manner, causing the spectator to take evasive action. The disciplinary hearing took place today in Cape Town and was be presided over by ICC Match Referee for the series, Chris Broad. “I took into account what I considered to be the mitigating circumstances of a spectator in close proximity to the player shouting at him as he returned to the dressing room,” Broad said in a statement. The news came as a bolt from the blue for the organisers of the $175,000 WTA Tour event. “It is very disappointing. She felt very sick because of a bad flu. 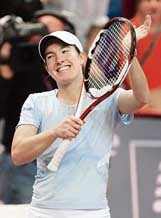 We came to know that she did not take the flight only at 3 am this morning,” a WTA Tour spokeswoman said. The photographers and the TV crew who had gone to the airport here at 4.45 am, when Williams was scheduled to arrive, returned a disappointed lot. It would have been Williams’ first ever visit to India. “I am very excited about the tournament. Indian tennis seems to be all about Sania Mirza, I want to see all that,” she had said last week. Williams’ place in the main draw was awarded to Dominika Cibulkova of Slovakia who was entered in the qualifiers that began today. The start of the main draw action on Monday coincides with the ‘Karnataka Bandh’, called to protest against the recent verdict in the Cauvery issue. For the Bangalore Open, it will be ‘Serena Bandh’. In a statement, Williams said, “I am very disappointed to have to withdraw from the Sony Ericsson International in Bangalore, which I was really looking forward to participating in. Unfortunately, I caught a bad flu and am too sick to compete. “I know with Sony Ericsson’s involvement and the incredible tennis fans in India, the event is going to be a great success, and I hope to be able to play in and see the incredible culture of India in the future. Pushed to the backfoot after Vivek Shokeen and Karan Rastogi lost their singles matches yesterday, Paes and Sipaeya made it 1-2 and kept India in the hunt with a 6-4, 6-4, 3-6, 4-6, 6-4 victory over Farrukh Dustov and Denis Istomin in the third rubber. Poulomi displayed ruthless form in her 11-9, 11-7, 11-5, 11-8 demolishing of Su but the talented Mouma could not repeat her yesterday’s good showing, losing to Yu Meng Yu of Singapore in a marathon 11-5, 8-11, 3-11, 11-9, 7-11, 8-11 duel. Compatriot Nandita Saha was unlucky to be drawn against top seed Bei Bei Sun from Singapore. The Indian lost all her four games 11-3, 11-3, 11-8, 11-7. In the other quarterfinal match, another Singaporean Lu Ming Ma got the better of a higher ranked opponent, third seed Yuki Nonaka of Japan. The Chandigarh leg will see some of the best in the world with Santi Freixa (Spain) and Jamie Dwyer (Australia) leading the foreign players’ charge. Meanwhile, Dwyer will play from tomorrow onwards but will be replaced by Brent Livermore (Australia) from February 23. Both will play for Maratha Warriors. In the inaugural match tomorrow, Chandigarh Dynamos will take on Sher-e-Jalandhar at 7 pm. While Shers are on the top of the table with 14 points earned from Chennai encounters, Chandigarh Dynamos’ could not demonstrate ‘up to the mark’ show and have just seven points. Though, Dynamos’ captain Rajpal Singh did not reveal the game plan for tomorrow match but he is still hopeful of showing good performance with present squad. On the other hand, Shers are ready to face all challenges. Mr Chander Shekhar, president, Chandigarh Hockey Association, said, “It is a mega event which is going to take place again in the city and the two PHL finals at Chandigarh in February last year had a 30,000 houseful crowd, as they say, which was many times more than any domestic cricket fixture including the Challenger series. I expect more this time”. Naming few players like Shavinder Singh, Raghunath, Jarnail Singh, Mr Jyothikumaran said that PHL is instrumental in spotting hidden talent. He also said just after the conclusion of the second leg, a national camp has been scheduled where new talent will be brushed up for national team to compete for forthcoming tournaments”. Sharath dumped the world No. 45 11-5, 11-3, 11-5, 8-11, 10-12, 11-9 in a thrilling tie, much to the cheer of the small crowd that came to see the country’s top paddler in the ITTF Pro Tour event. The Chennai boy, seeded fifth, has a good chance to making it to the final as he faces national champion Shubhajit Saha, who quelled a brave comeback from Soumyadeep Roy, in the semifinals tomorrow at the Indira Gandhi Indoor stadium. Saha was going great guns before Roy pulled back the match but went down 11-6, 11-4, 10-12, 11-8, 6-11, 7-11, 12-10 in a nerve wracking contest. Two other Indians in the fray, Jyoti Randhawa and Shiv Kapur failed to make the cut at the $1.3 million event. Jeev, who was tied 12th yesterday carded a shocking four-over 76 to be tied 42th along with compatriot Gaurav Ghei.